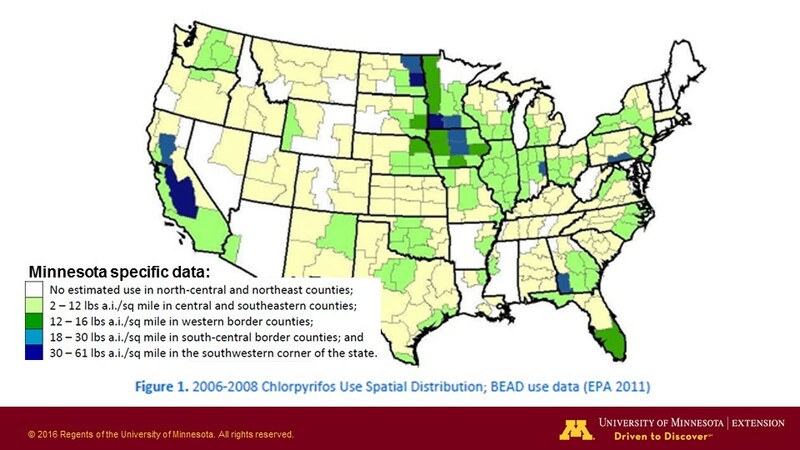 The Environmental Protection Agency (EPA) Administrator, Scott Pruitt, signed an order on March 29, 2017 denying a petition that sought to revoke all food tolerances for chlorpyrifos, an insecticide used effectively in U.S. agriculture since 1965.
sound science in decision-making – rather than predetermined results." The subject of this decision loomed large in the 2016-2017 winter meetings because of the possible loss of this pest management tool used in many of our important regional crops. A point of emphasis was the potential loss of this organophosphate insecticide in Soybean aphid (SBA) management programs. Organophosphate (1B) (chlorpyrifos) is was under review and re‐registration is was not a guarantee. A final decision is was anticipated by March 31, 2017 and it has now been issued. Pyrethroids (3A) have had confirmation of resistant soybean aphids in Minnesota. Resistance to one pyrethroid means they are resistant to ALL, though the degree may vary by the specific active ingredient. Neonicotinoids (4A) and (4C) are being challenged for their widespread use and potential risk to pollinators. We still need to be concerned about pyrethroid and neonicotinoid issues, ESPECIALLY the pyrethroid resistance threat. This is a problem that has been observed since 2013 and which escalated in 2015 and 2016. To address this problem, we need to begin judicious use of insecticides by treating fields ONLY when threshold populations are reached, rotate insecticide mode of actions, and encourage natural control (e.g., predators, parasites and pathogens). These actions can lead to reduced spraying and less selection pressure to find "surviving" aphids resistant to pyrethroids. 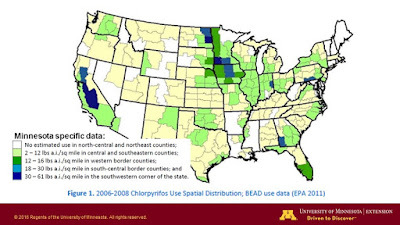 The availability of chlorpyrifos helps keep our options open if a field does reach the treatment threshold of 250 soybean aphids per plant with more than 80% of plants infested and aphid populations increasing.